Williamsburg Oil Paints source the best raw materials in the world. Each is carefully ground to enhance the beauty and luminosity specific to each pigment. These paints are uniquely hand-crafted and of the highest quality available. Color Swatches created using heavy application/medium application/50% tint and were applied on acrylic primed canvas (7 oz) material. Alizarin Crimson, the traditional cool counterpart to Cadmium Red, is a clear ruby-red with a maroon masstone and a bluish undertone. It is the artist's principal deep red pigment, is transparent, and has good tinting strength. It creates bright rosy pinks when mixed with white, a range of purples and violets when mixed with strong blues, can be slow drying when used with oils, and is compatible with all other pigments. Permanent Alizarin Crimson mixes well with Ultramarine in acrylic and watercolor form. Permanent Rose and Quinacridone Rose are possible alternatives on a watercolor palette. 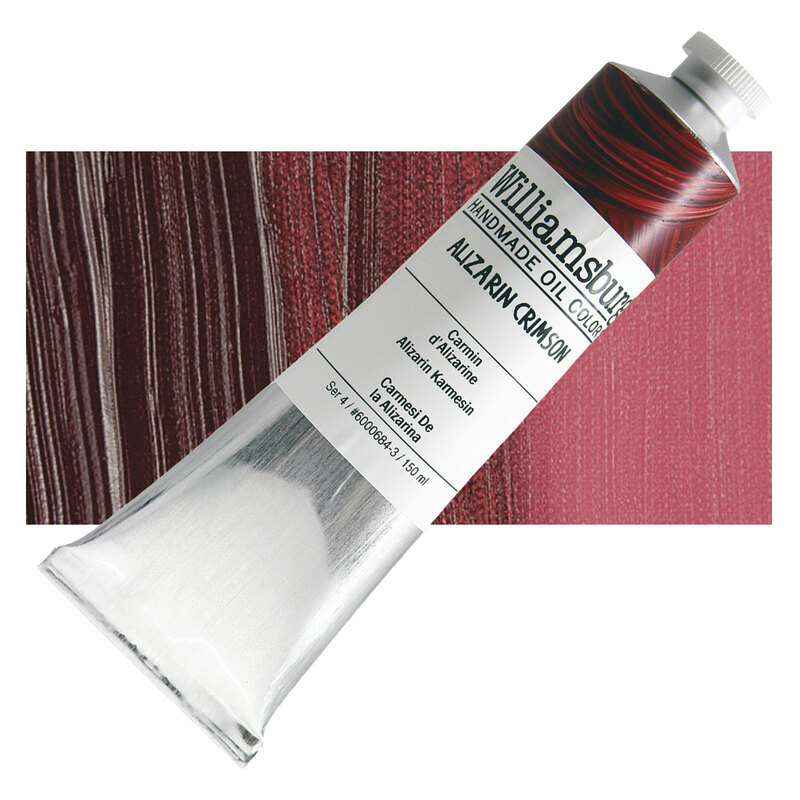 Alizarin Crimson is a popular glazing color. Alizarin Crimson is considered fugitive or marginally lightfast, and the appropriateness of its use in the modern artist palette is a subject of debate. There are many concerns regarding its permanence, particularly when mixed with ochre, sienna, and umber, or when used thinly. It is the least permanent red commonly used by today’s artists. Modern synthetic preparations of Alizarin Crimson have better permanence and lightfastness that the original natural pigment, which was extracted from the madder plant. Quinacridone pigments have been used to create a modern hue that closely matches the original hue, but many artists object that the transparency and handling characteristics are not the same as for the original. Alizarin Crimson can be slightly toxic if it comes into contact with skin and may cause some allergies. There is no significant acute toxicity. The word alizarin comes from the Arabic word al-usara , meaning juice . The base ingredient of this pigment is the Madder plant (Rubia Tinctorum). It was used for dyes and inks among craftsmen in Ancient Persia, India, and Egypt as early as 1500 BC In 1804, George Field, an English dye maker, developed Madder Lake by binding madder to alum, a white powder. The German chemists Carl Grabe and Carl Liebermann produced the first synthetic variety of this pigment, most commonly known as Alizarin Crimson, in 1868. They used anthracene, which greatly improved the lightfastness. The Colour Index International designation PR83:1 has been used to identify this synthetic laked pigment. Alizarin, Alizarin Carmine, Crimson Madder, Madder Lake. Rose Madder is a weak grade of Alizarin Crimson. ® Williamsburg is a registered trademark.